Very excited to share another His and Hers installment today. Today's cards are a colorful take on us both playing with some markers. We spent a little bit of time the other day coloring and just doodling. What do you all think?! To make both cards, we used Spectrum Noir markers. All of sets are particularly lovely, but this is a well-rounded one in terms of soft, muted colors, to which I've added a variety of other bolder shades. It helps having a variety of colors to extend out my rainbow. I thought it might be helpful to quickly add in our two-cents about these markers with a mini review! - We find them not to be quite as blendable as Copic markers, with some lines showing, but only slightly. So if you love blending, these may not be right for you. But if you're not seriously into coloring (like me) they work wonderfully! 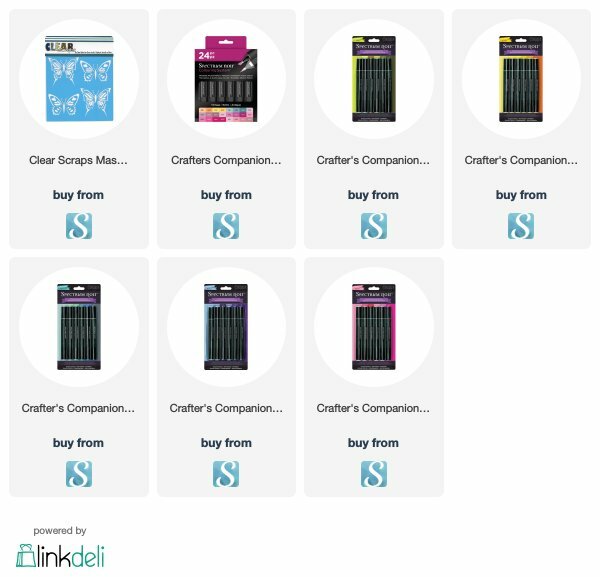 - We love that they're a fraction of the cost - it sure makes it easier to collect a variety of pretty tones. - We love the bold and fabulous colors! Both hubby and I commented on how pretty the shades were. I've yet to collect all the nuances of each color, but so far I'm quite happy! - The nibs of the markers are not quite as friendly towards blending, so I would not really designate this as a sketching marker, but more of an all-purpose marker that can be used to color in a variety of mediums, from paper to wood to fabric. Hope that mini review is helpful. As always, feel free to leave a question in the comments below! 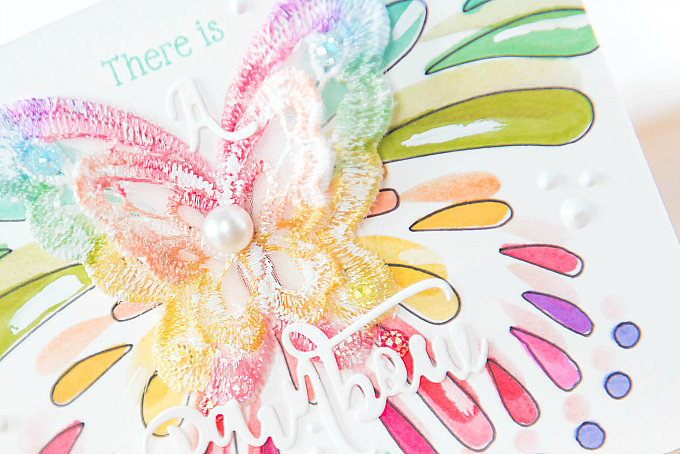 For my card, I used a big, beautiful butterfly stencil to draw out the butterfly. I was originally going to use pencil to create a no-line image, but I really love the bold black lines against all the color! Once I colored in each little bit, I re-positioned the stencil just slightly off the design, and used an ink blending tool to bring in some more color with a few coordinating dye ink pads. 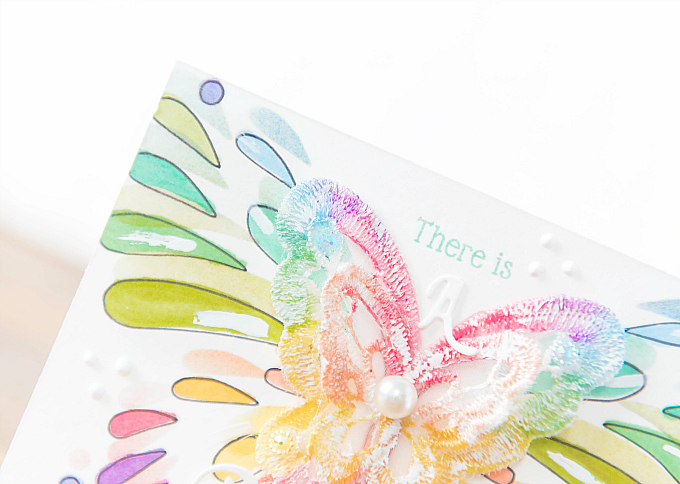 I really wanted to make the butterfly look layered and multi-dimensional, so I reached for a lace butterfly and used my markers to color it as well! I love using alcohol markers on fabric and other mediums. I also added a little bit of white paint to the lace butterfly and to the stenciled one as well. For the sentiment, I used PTI's Make It Market: Sunshine and Rainbows. It's one of my all-time favorites, and I love this beautiful sentiment. It perfectly describes how I feel each and every time I get to spend time with my bff. You might recognize hubby's design, because during our last His and Hers post, he added a little striped detail to his card, and this time around, he decided to make an entire card out of it! I absolutely love it to bits. Isn't it so fun and cheery!? 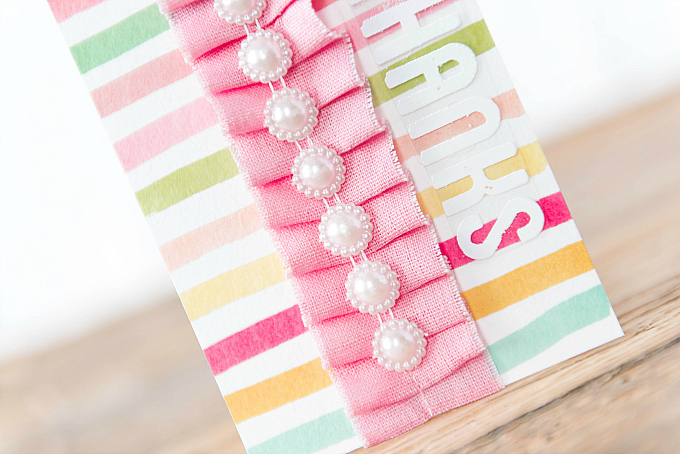 After freehanding the stripes in various colors, he added this pretty pleated ribbon, and some stringed pearls. I helped him emboss the sentiment, which he cut and adhered to the card. I hope you've enjoyed these two takes on how to use colorful markers! p.s You can check out other His and Hers posts here. Love this post, Ivana! 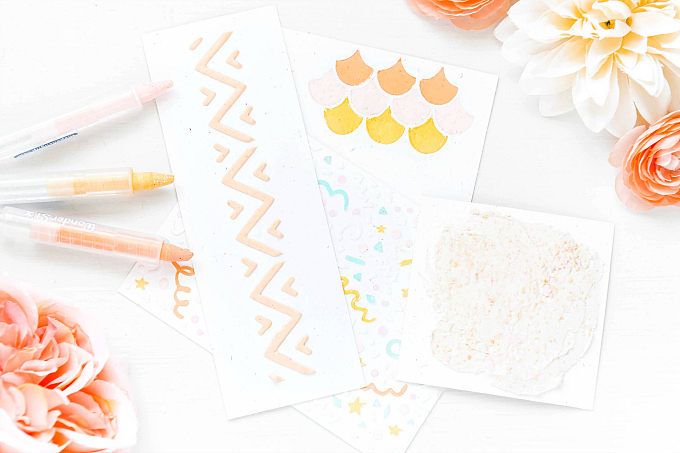 So fun to see how each of you used the markers & 2 great cards! 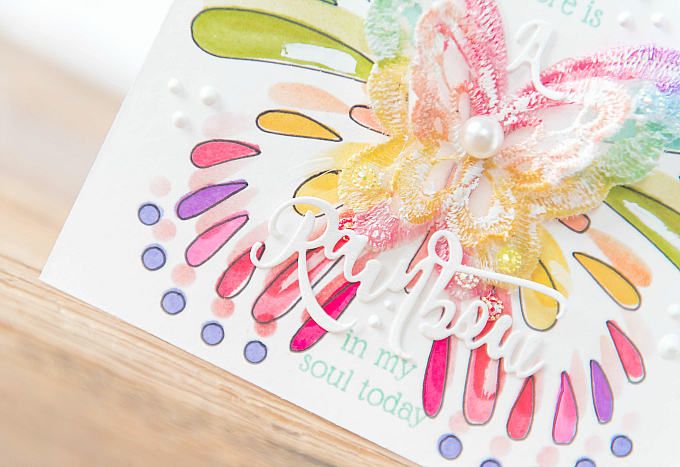 Love how you used the stencil & coloring the lace butterfly to match was brilliant! 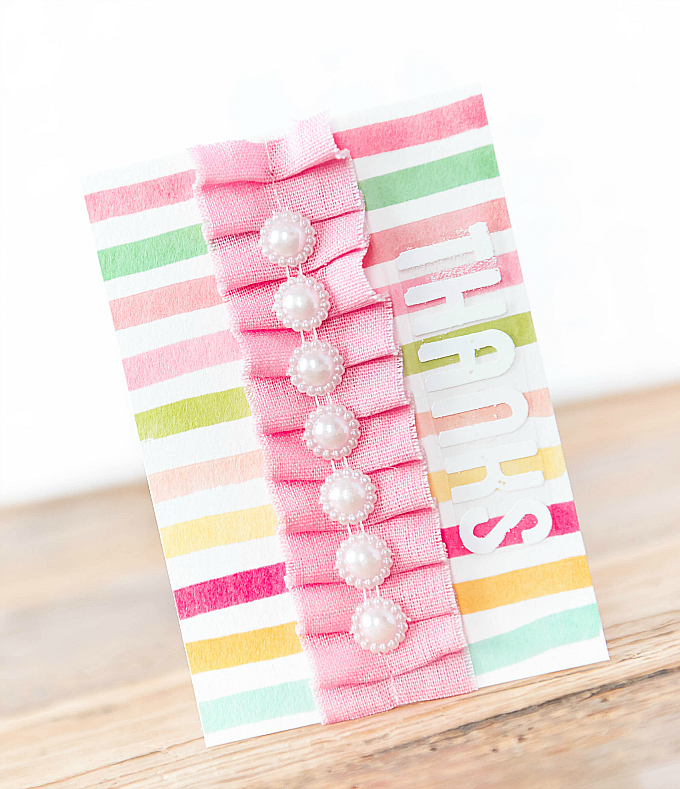 Been thinking about pleated ribbon--really love the look & adding the stringed pearls was brilliant!